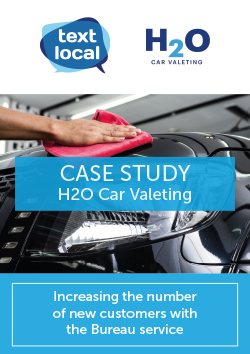 H2O Car Valeting owns 8 sites across the UK, offering premium and convenient car valeting services. Over the last 15 years H2O have expanded across the UK, offering seasonal discounts and tiered services to cater for all. To further develop their success, the team were looking for ways to raise their profile in two locations. H2O were looking to promote their Birmingham and Newcastle locations to a new audience. Raising their profile within the area as well as growing their existing customer base by capturing the emails and names of those within the campaign. H2O enlisted the help and experience of the Bureau team as they were unable to dedicate the time and resources to two large campaigns. Through the Bureau service, the team at H2O wanted to increase the number of visitors to these locations using an incentive based campaign. The SMS campaign featured a 25% promotional offer for new customers and included a link to a data capture form, so the team could record the name and contact details of interested customers. Once the form had been completed the customer would have access to the discount code. Through the targeted SMS campaign, H2O saw a dramatic increase in contacts originating from the linked data capture form.